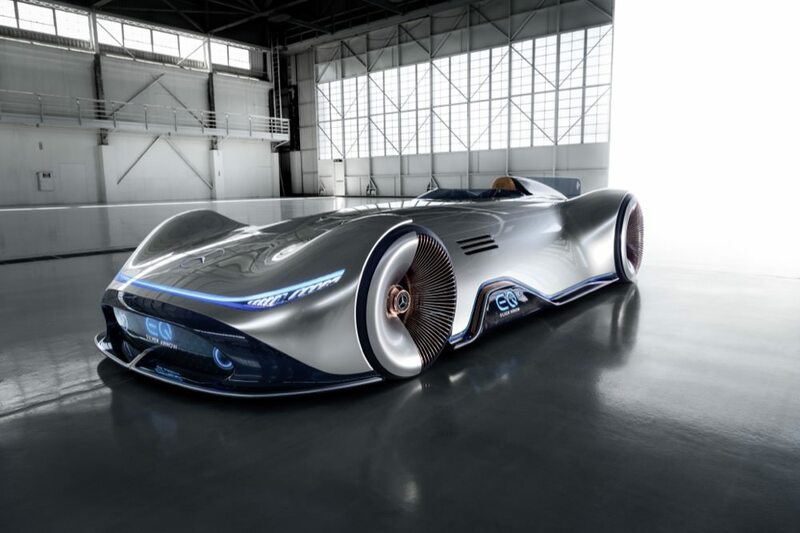 Past meets future in the form of the Mercedes-Benz Vision EQ Silver Arrow. Mercedes-Benz chose Pebble Beach to unveil its latest, highly stylish concept, which it calls the Vision EQ Silver Arrow. The car is a homage to the company’s fantastic race cars of the past with a modern and electrified twist resulting in something that is as much art as automotive. In a further nod to the past, Mercedes chose to paint that beautiful bodywork in the same Alubeam Silver as the original Silver Arrows. This distinctive colour came from the omission of a white paint layer on the original race cars to save weight. Its ultra-aerodynamic look is very much a modern interpretation of the W 125 car from 1937. That car set a record-breaking top speed of 432.7 km/h on the A5 autobahn between Frankfurt and Darmstadt. The car measures 5.3 metres in length, and the carbon fibre bodywork appears almost fluid as it covers the mechanical underpinnings. A continuous light strip skirts the base of the car and wraps up and around the rear diffuser. Additionally, it contains two rear spoilers that extend and act as air brakes to help slow the car. The intricate wheel design consists of 168 spokes per wheel. Furthermore, each is made from lightweight aluminium and wear a rose gold paint finish. Fixed hub caps cover half of the leading edge of each wheel. Along with the enclosing bodywork, only the rear side of each wheel is left visible. Also, it wears slick Pirelli 255/25 R 24 tyres at the front and 305/25 R 26 at the rear. When the cockpit cover lifts up to allow access for the driver, it reveals a plush interior that features polished aluminium, solid walnut and a leather seat complete with a four-point harness made in the matching blue of the EQ logo. The dashboard, in contrast, is ultra modern, consisting of a curved panoramic screen with back projection. A touchscreen sits within the centre of the steering wheel. The EQ name will feature in all future Mercedes-Benz electric vehicles, and this concept is also electric. Its total power output is 750 hp, and it has a battery capacity of 80 kWh to provide a range of over 400 kilometres. The side vents are there to aid battery cooling. “Over 80 years ago, the historic Silver Arrows demonstrated that Mercedes-Benz was a pioneer when it came to speed thanks, among other things, to their streamlined shape,” says Gorden Wagener, Chief Design Officer at Daimler AG. ← The Bugatti Divo is slower but better for drivers. What’s a Porsche 718 T all about? April 6, 2019 Matt Robinson Comments Off on What’s a Porsche 718 T all about? The Best Cars in The World? March 27, 2019 Matt Robinson Comments Off on The Best Cars in The World?